But he reserved his harshest criticism for Obama. Stewart his administration's seeming proficiency at coming down with an iron fist on certain issues to bureaucratic incompetence on others, like the backlog of applications for benefits at the Department of Veterans Affairs. 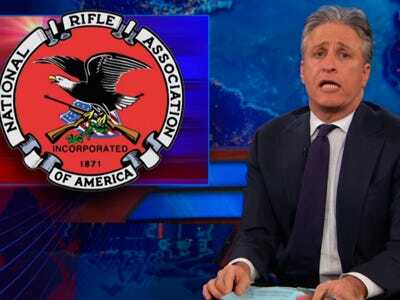 Daily Show host Jon Stewart tore into the NRA on Wednesday night, quipping that the organization was a covert operation run by Michael Moore in an "attempt to discredit responsible gun owners." But Stewart saved his harshest NRA criticism for the reaction to President Barack Obama's proposals to curb the nation's rash of gun violence. Stewart cut to a clip of a pro-gun rights guest on CNN, who said that the U.S. needs to simply enforce the gun laws it already has on the books. Stewart went on to explain how that was nearly impossible because of the restrictions imposed on the Bureau of Alcohol, Tobacco, Firearms and Explosives. Stewart highlighted Rep. Todd Tiahrt, who in 2007 suggested that mayors shouldn't try to trace the source of illegal guns because the ATF is "going after them 24/7." But in reality, Stewart said that the ATF is full of dysfunction because of inadequacies in its setup. For instance, its current director, B. Todd Jones, doubles as the U.S. Attorney for Minnesota. "You're telling me this dude ... has another full-time job?" Stewart quipped. "He's just moonlighting?" The Senate hasn't confirmed an ATF director since 2006. The body has to confirm the position because of a 2006 provision inserted into a Patriot Act renewal by Rep. Jim Sensenbrenner. "I don't have footage of that. ... I do have footage of Sensenbrenner from that year, accepting the NRA's coveted Defender of Freedom Award," Stewart said. Stewart pointed out other problems—like how the ATF is prohibited from creating a federal registry to track gun sales. It also is barred from releasing information from its firearms trace database to anyone other than a law enforcement agency or prosecutor. Stewart then revealed that the Congressman who authored the amendment with so many limits on the ATF was the aforementioned Todd Tiahrt. Stewart said the amendment couldn’t be worse if the NRA wrote it themselves." Stewart got word from his "messenger pigeon" that, indeed, the NRA "did write that law." Daily Show host Jon Stewart fired back last night at economist Paul Krugman over the idea of minting a trillion-dollar coin to work around the debt ceiling. It continued a riff that was forged over the weekend when Krugman slammed Stewart for being "lazy" in satirizing the idea. 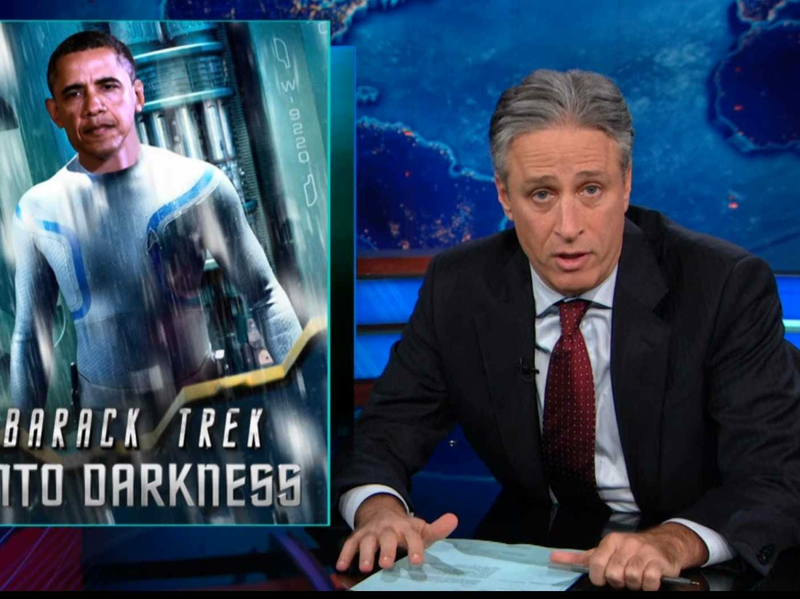 Stewart mocked Krugman as "the only creature more noble than a freshly felched unicorn" and "the rare gray-bearded urban laureate." He took issue with Krugman calling him "lazy" in a blog post over the weekend, joking that he was "banging it out four days a week, 22 minutes a day!" Stewart then played a clip of Krugman saying Stewart was "ruining his brand" by not doing enough research and mocking the opposition. "I'm pretty sure that is my brand," Stewart quipped. Then he added this kicker: "If somebody is ruining their brand with a trillion dollar coin idea, I don't think it’s the non-economist." 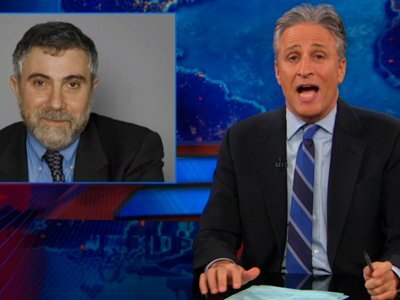 Stewart noted that he was a fan of Krugman.